Product #17584 | SKU PXW-X70 | 0.0 (no ratings yet) Thanks for your rating! 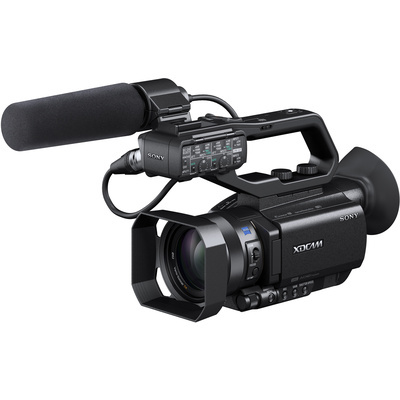 The Sony PXW-X70 Professional XDCAM Compact Camcorder (PAL) is about the same size as a conventional 1/3" (8.5 mm) professional compact camcorder, but it features a 2.54 cm sensor, which is larger than a super-16 sensor and more than eight times the size of a 1/3" (8.5 mm) sensor. The larger Exmor R sensor size provides for more cinematic-appearing depth of field than a 1/3" (8.5 mm) sensor is capable of, and features a backside illuminated design for improved low-light performance. It features an integrated 12x optical zoom lens with a manual lens ring for zoom/focus control, and a three-level switchable ND filter. The top handle incorporates two 3-pin XLR inputs for recording audio from XLR microphones. The camera records HD video using the XAVC Long-GOP codec with 4:2:2, 10-bit colour sampling at 50 Mbps, providing footage with a high data rate that is suitable for broadcast applications. Sony's Slow & Quick Motion is built into the camera. The camera features two SD card slots, allowing simultaneous and relay recording, and offers both a 3G-SDI and an HDMI output. The camera supports control via Wi-Fi using smartphones, tablets, and the optional Content Browser Mobile application. Optional upgrades allow the PXW-X70 to record in 4K UHD (SonyCBKZ-X70FX, sold separately), as well as add file transfer and streaming via Wi-Fi. An optional upgrade via a licence key (Sony# CBKZ-X70FX) allows the camera to record 4K. * The 1" sensor features 14.2 million effective pixels on a sensor that is more than eight times larger than a 1/3" (8.5 mm) type sensor. The larger size of the pixels allows them to gather more light compared to a 1/3" (8.5 mm) sensor. The Exmor R designation indicates the sensor features a backside illuminated design, which allows more light to reach the sensor's photosites for increased light sensitivity and less noise in low-light conditions. * The PXW-X70 weighs approximately three pounds (including the XLR handle unit, NP-FV70 battery, lens hood, and large eyecup). It features professional interfaces including 3G-SDI and HDMI output connectors, an XLR handle unit with zoom lever, a manual lens ring that can control zoom and focus, and an ergonomic palm grip with large zoom lever. It records video to two SD memory card slots that can be used for simultaneous or relay recording, and to back up files. * The camera is capable of using Sony's Slow & Quick Motion recording, which allows you to shoot at selectable frame rates (1, 2, 4, 8, 15, 30, 60 / 1, 2, 3, 6, 12, 25, 50). * The integrated 12x optical zoom lens incorporates a three-level switchable ND filter, with 24x Clear Image Zoom technology that retains the quality of the HD image, and a digital extender that allows you to zoom up to 48x. * Multiple recording choices are available depending on the application, including XAVC, AVCHD, and DV file-based recording. The PXW-X70 records in XAVC using the MXF file format, which efficiently compresses Full HD (1920 x 1080) resolution using the MPEG-4 AVC/H.264 codec. Colour sampling is 4:2:2 10-bit with high-efficiency, Long-GOP compression at 50 Mbps, 35 Mbps, or 25 Mbps for broadcast quality images. * Supporting Near Field Communication (NFC) functions, the camera allows easy, one-touch wireless LAN connection to a smartphone or tablet, while the Content Browser mobile application allows confirmation of shot angles and operation of the camcorder by remote, including spot focus and iris adjustment.